This animated GIF shows a sequence of radar amplitude images that were acquired by the Agenzia Spaziale Italiana CosmoSkyMed satellite system. 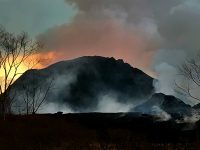 The images illustrate changes to the caldera area of Kīlauea Volcano that occurred between May 5 and June 14 at about 6:00 a.m. HST. The satellite transmits a radar signal at the surface and measures the strength of the return, with bright areas indicating a strong return and dark areas a weak return. Strong returns indicate rough surfaces or slopes that point back at the radar, while weak returns come from smooth surfaces or slopes angled away from the radar. Over time, expansion of the summit eruptive vent within Halema‘uma‘u crater and the widening of Halema‘uma‘u itself are clear. The last four images in the sequence, from May 29-June 14, show the development of several cracks outside Halema‘uma‘u (also seen in recent UAS footage of the crater) and inward slumping of a large portion of the western, southwestern, and northern crater rim. Much of this motion appears to be coincident with the small explosions from the summit that have taken place on a near daily basis over the past 2 weeks. We expect this slumping to continue as long as the explosions and overall subsidence persist. Map as of 10:00 a.m. HST, June 15, 2018. Given the dynamic nature of Kīlauea’s lower East Rift Zone eruption, with changing vent locations, fissures starting and stopping, and varying rates of lava effusion, map details shown here are accurate as of the date/time noted. Shaded purple areas indicate lava flows erupted in 1840, 1955, 1960, and 2014-2015. This is a Civil Defense Message for 6 p.m., Friday, June 15, 2018. 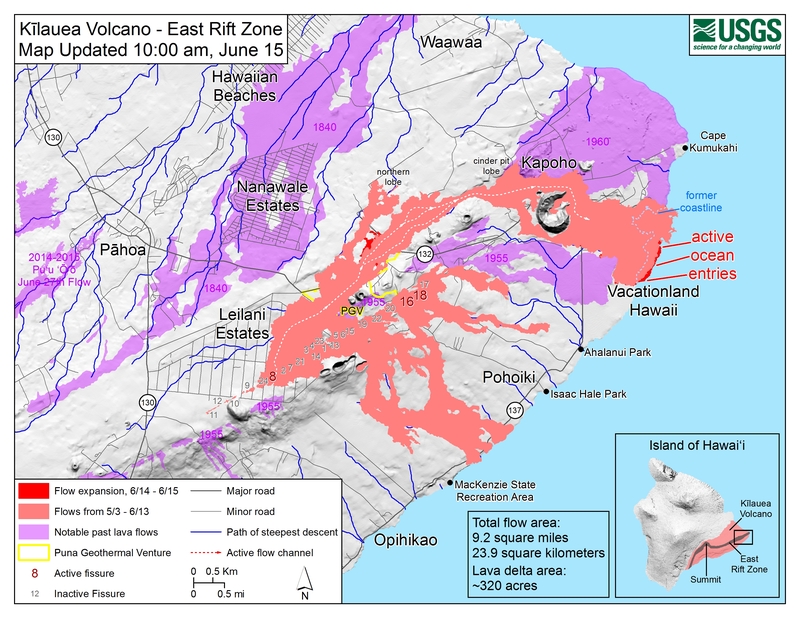 Hawaiian Volcano Observatory reports that the eruption activity continues at Fissure 8 in the lower East Rift Zone. Lava is entering the ocean at Kapoho Bay and producing a large laze plume. An explosive event at the Kilauea summit earlier today produced an ash plume that rose up to 10,000 feet and dispersed. The National Weather Service reports heavy vog is blanketing the interior and southern parts of the island, impacting Hilo and wrapping around to Kona through the weekend. Due to the hazardous air quality conditions, the following guidance is given. 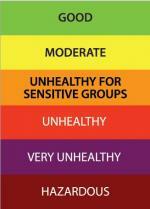 Do continue to be on the alert for air quality conditions around you. Limit outside activities and stay indoors if you have breathing issues. Residents of Hawai‘i County who suffered damage or losses from the recent Kilauea volcanic eruption and earthquakes, can now register for disaster assistance with the Federal Emergency Management Agency (FEMA). The Disaster Recovery Center (DRC) is open daily from 8am to 8pm, and is located at the Keaau High School Gym. Shuttle buses will be running between the two shelters and the DRC from 7:30 am to 9 pm. The shuttles run every 20 minutes from the Keaau Armory, and every hour from the Pahoa Community Center shelter. The full bus schedule is listed below. For a list of the information you need to bring with you to the DRC, or if you want to register online, go to www.DisasterAssistance.gov.